This past weekend was super awesome. After several weekends abroad I finally got to be lazy. I didn't cook much and I didn't post on here. Instead I just enjoyed the good weather, had Tacodeli for breakfast, and napped every single day. We had a blast. It all started on Saturday with a brunch at Roni's parents' place. Her mom made a traditional Israeli breakfast dish, shakshuka (a secret recipe that I want to learn from her), hummus, and carrot salad. We also had a delicious Israeli chopped salad that Roni's sister made. I decided to contribute my own mom's specialty to the meal- eggplant spread à la Rodica. If you were wondering what Rodica means, it is just my mother's name. This spread is special for several reasons: 1) it's my mother's recipe, 2) it got even Roni's mom to eat an eggplant dish even though she's not a big fan of eggplant, and 3) because it's my favorite spread from childhood. It is very similar to baba ganoush, which is not surprising since Romanian cuisine has been greatly influenced by Ottoman cuisine. For almost 300 years Romania was under the rules of the Ottoman Empire and that's when eggplant, peppers and other nightshade fruits and vegetables made their way to Romanians' tables. Dishes like moussaka, eggplant stuffed with lamb meat, and zacusca are all based on eggplant and are very common in Romania. Of course, some recipes are a bit different from the traditional Ottoman ones but that's mostly due to the fact that some ingredients weren't available in Romania. People had to innovate by replacing those ingredients with whatever was easy to find. If baba ganoush uses tahini, my mother's eggplant spread uses homemade mayonnaise. I have never tried to make it with store bought mayo, and I recommend you not doing it either. It's just different and will taste nothing like Rodica's recipe. This spread reminds me of hot summer days at my parents’ lake cabin at Mujdeni, Romania. It was beautiful and we loved spending time there. The scenery was gorgeous too as the whole lake is surrounded by hills and forests. Although the cabin had two stories, it wasn't very big. On the bottom floor we had the kitchen and living room with a big queen size bed. Usually my parents slept there. To get to the upper level you had to climb a ladder, so that was reserved for the kids. There were two smaller rooms upstairs with a twin bed in each. Normally you'd think that only my parents, my sister and I would sleep there, but sometimes we had cousins or family friends over for days. We slept on the floor on mattresses or in sleeping bags outside on the deck. It was so much fun and it never felt like the house was too small. For outdoorsy kids like my cousins and I it was heaven on earth. We got to spend all day outside, swimming, sunbathing, playing soccer, badminton, volleyball or fishing. The adults loved it too. They would make the kids collect firewood from the forest so they could cook traditional dishes like Gulyás (goulash), Pörkölt (Hungarian stew) or Halászlé (a hot paprika based fish soup) all made in a bogrács, which is a traditional Hungarian enamel cauldron. Then they would grill all kinds of traditional Romanian meats (mititei, carnati de casa (homemade sausages) and slanina (bacon)) and veggies on a plow disc cooker simply called disc in Romanian. It was a feast and it always felt as if we were celebrating something. All these dishes took a long time to cook though, so my mom always had to think ahead and prepare some "snacks" for the hungry kids who spent all day swimming in the lake or running and jumping in the sun. On a scale of 1 to 10 we were constantly at 10 in terms of hunger. Every 2 hours we'd get hungry and my mom would always have something for us. Something as simple as bread with homemade apricot or strawberry jam or bread and butter with cured meats and fresh tomatoes, onions, radishes and hard boiled eggs. Another favorite was her eggplant spread. My cousins and I went crazy over it. Mom would make it out of 10-12 eggplants and we'd finish it within a day or two. We would eat thick loaves of fresh crispy bread loaded with a thick layer of the spread with a side of Telemea cheese (Romanian feta) and fresh tomatoes and cucumbers. We were never bored there. We always found something to do. At night we'd play cards, tell stories or sing by the candlelight. The kids would sip on their homemade elderberry or sour cherry syrup mixed with club soda, while the adults would drink homemade wine or beer. We never complained about having to use the outhouse, not having electricity, or having to walk every morning to the spring for water for drinking, cooking and washing dishes. We were all so happy there. Preheat grill to 450F (230C). Alternatively you can use a flattop cast iron grill (plancha) on medium-high heat. My mom swears by the latter. Using a fork, pierce the eggplants. Place them on the grill rack (or on the plancha) and roast them until the skin blisters. I prefer charring them a bit, for that extra umami flavor. This should take about 35-40 minutes. Turn them every 10-15 minutes. Once the eggplants are grilled, put them in a colander, cover with aluminum foil and let them rest for about 10-15 minutes. This will help get rid of the bitterness of the eggplant. Peel eggplants and chop them roughly. You have two options now: a quick one, where you combine all the ingredients and using a hand mixer, mix them together until you get a smooth spread; or a longer one where you make the mayonnaise separately using the egg yolks, salt, mustard, white pepper, lemon juice, vinegar and oil and only then using a hand mixer to mix it with the eggplant, onion and garlic. My mom never bothered making the mayo separately, so I will leave it's up to you to decide which route to take. I tried both options and honestly neither I, nor my taste tester, Roni, was able to tell the difference. Let the spread rest for at least 45 minutes in the refrigerator before serving. Serve it on toast with feta cheese and paprika sprinkled on top or simply use it as a dip with pita bread. It goes really well with fresh tomatoes, cucumbers, radishes and peppers. The size of the eggplant will impact the grilling time, so if you have smaller eggplants it will take less. Don't be surprised by the amount of salt you'll need to use. It's normal when working with eggplant. If you don't have a hand mixer, use a food processor, but be aware that making it this way you'll get a much smoother and silkier spread. I like the hand mixer version, because the spread will be a bit chunky. There is nothing I hate more than not sticking to the commitments I make. Back in April I made a commitment to post on gourmetcubicle twice a week, but this past Thursday I skipped a post for the first time. As I mentioned last week, I am on a crazy round the world trip for work and my free time has been limited. I left Hungary today and I'm in Amsterdam right now waiting for my connection to Singapore. I have 30 minutes to write a short, simple and sweet post, just like the recipe that you're about to read. It is hard to write about fruit right now as I kind of got used to eating huge amounts of meat this week. As mentioned in previous posts, Hungarians and Romanians don't bother with salads and sides, rather they go straight for the meat. Meat is like the ambrosia for the gods around here. So I am happy to get to eat seafood and more exotic food for the next few days in Singapore. Then I'll go to Tokyo where ramen and yakitori will compensate for the lighter fare I'll have in Singapore. This recipe is for anyone who, like me, prefers fruity and refreshing desserts. I got the idea of using zabaione during a free cooking class I attended at the Cordon Bleu school not long ago. I grilled what I had on hand that day. The decision to use white wine instead of Marsala may sound like an odd choice, but before you start judging me, give it a shot. It will blow you away. They are calling my name on the loud speaker for boarding. I think it's a good time to leave you to the recipe. See ya! Heat grill to high. Place fruit on the grill, the cut side down and sprinkle only the plums with a tablespoon of sugar. Grill plums and peaches for about 2-3 minutes until slightly caramelized. Flip the peaches and plums and grill until they are heated through, about 1-2 minutes. If you grill them any longer they'll become mushy. The pineapple will need more time, about 5-6 minutes on each side. Remove from the grill. Place double boiler over medium high heat. If using the saucepan-bowl combo, fill up the saucepan with an inch or inch and a half water and bring it to a boil over medium-high heat. Combine the egg yolks, sugar, vanilla and lemon zest in the bowl and whisk vigorously until the mixture becomes pale and slightly frothy. Place bowl over the saucepan filled with water slowly pour the wine into the bowl, whisking vigorously again until the mixture becomes slightly thick and creamy, about 10 minutes. Remove from the heat and let it cool. 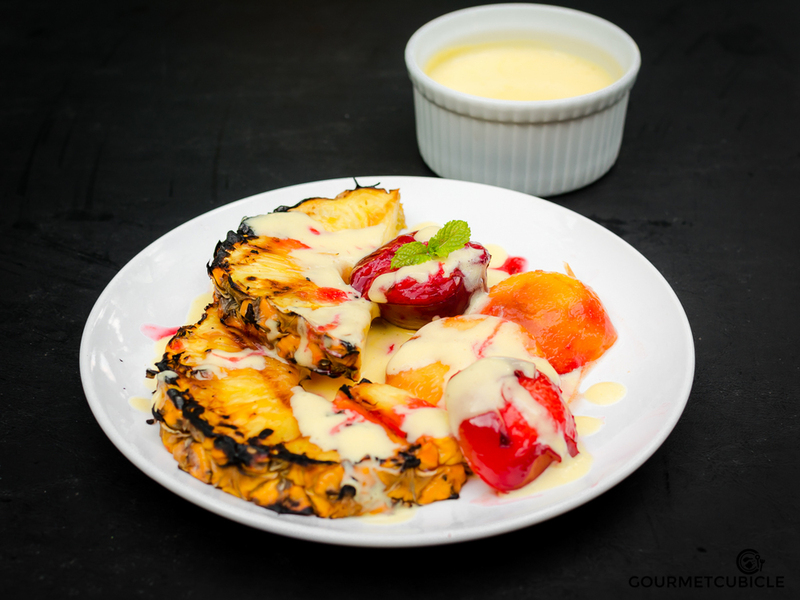 Sprinkle just a little bit of zabaione over the grilled fruit and serve the rest in a dipping bowl on the side. If you're left with zabaione, keep it in the refrigerator. It will stay good for up to 2-3 days. Enjoy! For the zabaione you'll need either a double boiler or an improvisation consisting of a glass or metal heatproof bowl and a saucepan. If using the latter, fill up the saucepan with an inch or inch and a half water. When the bowl is placed over the saucepan the water should not touch the bottom of it.